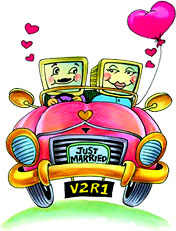 Rediff On The Net, Life/Style: Prem Panicker witnesses a cyber-wedding. And comes away with a lump in his throat. On the last day of May, I attended a wedding. It was at a small, private chapel. Attended by a small, select audience. The bride was 41 and a housewife. The groom, 31, and a professional. She is from America, he is an expat Indian. A fortnight and more later, I find I still cannot get it out of my mind. Because, you see, it was no ordinary wedding. The whole thing happened up there in cyberspace. The bride and groom have not seen each other, though they have exchanged photographs. When they got married, they did not even know what each other's voices sounded like. And yet, neither of them are in any doubt whatsoever that the ceremony was, for them, totally, completely serious. And very, very real. "I want to write about a fellow who was two fellows." That was how R L Stevenson summed up the core of his Dr Jekyll and Mr Hyde. I don't know about you guys out there but, speaking for myself, I am "a fellow who is two fellows." There's what I suppose you could call the public me. It's a very reserved persona, this. Very cynical. Very much a creature that acts, reacts, interacts from the mind and not the heart. It's a me that thinks "family" is as medieval a concept as "once upon a time there was a king...". A me that thinks "friends" are something that come out of the closet during fair weather -- like pastel T-shirts, say. But there is also another me. A little, wide-eyed, childlike me. A me that, come December 24, curses modern flats because they don't do you chimneys and wonders if the ventilator grill is big enough for Santa Claus to crawl through. A me that sits under the Big Top and looks up to see not ill-paid, undernourished, exploited females in patched-over sequin dresses, but a flock of fairies light as a lover's breath, playing in the upper realms where only dreams can take you. And, throughout the duration of that ceremony, these two fellows that are both me fought a bitter civil war inside my head and my heart. The rational me, watching the bride's 21-year-old cyber-daughter call the 31-year-old groom 'father', felt that familiar downward curl of the lower lip... the outward symptom of an inner cynicism. The childlike me, which most of the time stays hidden deep down -- way deep, where people can't hurt it with a random phrase or thoughtless remark -- was, however, misty-eyed throughout. As I watched the "minister" -- a 21-year-old friend of the groom and bride -- take the couple through their vows, tailoring his words for the demands of cyberspace, as I saw the 21-year-old girl "strew heaven's most precious flowers for her mother to walk on", as I saw bride and groom promise each other that they would strive to overcome the limitations of time and of space and to cherish the other with every fibre of their hearts and souls, I felt a lump in my throat. And, at the end of it all, I realised that the naive, childlike me had won the war over his sneery-faced, cynical alter ego. The heart, not the head, had triumphed. Millions of people being lonely together -- that was how, some years ago, a wit described New York city. Today, that description is true of the world. I grew up in an ancestral home in Calicut city, in Kerala. The nearest neighbour, then, was a good five minutes away. And yet, every joy and sorrow felt in that neighbouring home raised echoes in ours. Today I live in a flat, in Bombay. The nearest neighbour stays just a wall away. And yet, when I lost my father a couple of months ago and went to Calicut for a fortnight, my neighbours did not even know I had been away. Paradoxical, but true, that with every million added to the world's population, we are coming closer together in a physical sense -- and yet, ever more and more remote from each other in a metaphysical sense. The world is today shrunk to the dimensions of a global village -- and yet each member of the human race is in self-imposed quarantine. Remote from, untouched by, his fellows. Today, at the very epicentre of the population explosion, loneliness rules.